The prestigious Hotel Zetta in San Francisco, part of the Viceroy Urban Retreats Collection, has partnered with MCOMS, a leading guest-facing solution provider to offer a complete cloud-based hospitality solution that will further elevate the guest experience. MCOMS designed a custom cloud-based solution to help clients fully take advantage of the amenities and hotel services available through HOTstream Interactive platform. Guests now have the opportunity to experience Hotel Zetta’s award-winning services in a paperless and user-friendly way from their in-room TV as well as enjoy a vast variety of channels. The Hotel Zetta also chose to install MCOMS HOTstream Cast solution powered by Chromecast to offer a seamless casting experience that feels like home. Ideally situated in the bustling heart of SoMa (South of Market Street), adjacent to the Westfield Shopping Centre just steps from Moscone Center, Hotel Zetta is a boutique hotel offering an unique enclave for savvy travelers, culture seekers, and local creatives. Hotel Zetta provides a high level of sophistication and service in a fresh, sustainable, vibrant setting. MCOMS will be showcasing the HOTstream solution at STAY BOUTIQUE LIVE, THE TRIFECTA, in The Reef @ The Magic Box, Los Angeles, CA on February 12-13. You are welcome to visit us and request a live demo. In San Francisco, a city of bold contrasts and timeless originals, Hotel Zetta stands out. Ideally situated in the bustling heart of SoMa (South of Market Street),adjacent to the Westfield Shopping Centre just steps from Moscone Center, Hotel Zetta is a boutique hotel offering an unique enclave for savvy travelers,culture seekers, and local creatives. For travelers in search of ultra modern accommodations and dynamic gathering spaces in the cutting-edge neighborhood of Union Square, Hotel Zetta provides a high level of sophistication and service in a fresh, sustainable, vibrant setting. Housed in an elegant neo-classical building, the hotel’s interior design has embraced this classic old-world environment as the counterpoint to a completely modern renovation. The hotel’s clever fusion of past and future will attract discerning travelers from around the globe as well as local innovators from SoMa’s thriving tech, fashion, and art communities. Viceroy Hotels & Resorts inspires travelers with one-of-a-kind authentic lifestyle experiences that bring together provocative design and intuitive service in sought-after locations. A leader in modern luxury, Viceroy’s vibe-led hospitality is guided by the brand promise “Remember to Live,” an affirmation to create lifelong memories for each and every guest. Viceroy destinations a resegmented into three distinct portfolio tiers to help travelers find exactly the kind of experience they’re looking for. The Viceroy Icon Collection properties include epic hotels and resorts in Los Cabos, Chicago, Dubai ,Beverly Hills, Riviera Maya, Snowmass, and St. Lucia, with forthcoming openings in Algarve and Panama. The Viceroy Lifestyle Series hotels and resorts are found in attitude-led destinations including New York and Santa Monica, with a forthcoming opening in Serbia. The Viceroy Urban Retreats in San Francisco have an independent spirit and bold, eccentric personalities. Viceroy Hotels & Resorts is a member of the Global Hotel Alliance (GHA) DISCOVERY, a unique loyalty program offering exclusive benefits and experiences to its members at over 500 hotels around the world. For more information, visit www.viceroyhotelsandresorts.com. Follow Viceroy Hotels &Resorts at www.facebook.com/ViceroyHotelsAndResorts/ and on Instagram and Twitter@viceroyhotels. MCOMS is proud to announce its collaboration with yet another prestigious property, Salamander Resort & Spa in Middleburg Virginia. The hotel has selected the HOTstream Mosaic solution for all its 168 rooms. Set on 340 acres nestled into the foothills of the Blue Ridge Mountains amid Virginia’s famed horse and wine country, Salamander Resort & Spa is an opulent and homelike destination. In keeping with the country estate design, all 168 rooms and suites are comfortably spacious and include an outdoor patio or balcony. MCOMS designed an in-room solution that will enhance the guest experience offering a large selection of benefits including hotel services and facilities. The Resort also deploys the HOTstream Cast solution, allowing guests to share their content on the big screen through their personal devices. Utilizing Apple TV and Miracast, guests can enjoy the same streaming experience that they enjoy at home. Salamander Resort & Spa is a LEED Green Building Certified resort situated in the historic village of Middleburg, VA, on 340 picturesque acres. Located only one hour from Washington, D.C., and just 35 minutes from Washington Dulles International Airport, the resort is designed to respect the architectural traditions of Virginia’s countryside with 168 spacious rooms and suites that blend into their natural environment. Resort Owner Sheila C. Johnson has created a luxurious destination featuring an award-winning 23,000-square-foot spa, Harrimans Virginia Piedmont Grill,the Gold Cup Wine Bar, a dedicated Cooking Studio, a chef-inspired Culinary Garden as well as the adventurous Tree Top Zip Tour. The resort includes a full-service Equestrian Center with unique programming, a 22-stall stable and riding arena. All spa, culinary and equestrian programs are open to the community. MCOMS is a leading guest-facing solution provider for the hospitality, cruise ship,healthcare, transportation and other industries. MCOMS designs, develops and operates advanced IPTV, VOD, Mobile, Cast and Signage solutions for multiscreen environments, including applications for Smart TVs, set-top boxes, smartphones,tablets, laptops and digital signage monitors. MCOMS has regional offices in Europe, North America, Middle East, Africa and Asia-Pacific and a worldwide network of partners. MCOMS HOTstream delivers digital content, connectivity, and commerce services to hotel guests and travelers on multiple devices via ONE centralized platform! Our IPTV, VOD,Mobile, Cast and Digital Signage platforms are completely integrated and commerce ready for hotel guests. MCOM Media Communications proudly announces the integration of MCOMS HOTstream solution with Samsung’s new Tizen platform. The integration is the result of many years of close collaboration between the two companies, to deliver best-in-class performance and high quality solutions for the hospitality industry. Samsung’s Tizen platform provides new functionality, delivering enhanced graphics, improved stability and an improved user interface, creating a more desirable Smart TV user experience. Tizen has also been configured to support various devices guaranteeing much more flexibility. MCOMS R&D team has already completed the porting of Samsung’s cross-architecture open source software to all HOTstream solutions including Casting, Signage, VOD and IPTV solutions to ensure a very robust integration that will maximize the benefits for both the guests and the hotel and will take advantage of the full range of tools, bringing together a unique hospitality experience. MCOMS will be showcasing the HOTstream solution at HITEC Amsterdam 2018, at booth 140, in Amsterdam RAI, on April 12th and 13th. You are welcome to visit us and experience firsthand the amazing results. Limassol, Cyprus, November 28, 2017. Amathus Beach Hotel Limassol (https://www.amathuslimassol.com/), member of the Leading Hotels of the World has chosen to install the MCOMS HOTstream solution in all its 239 rooms. MCOM Media Communications welcomed the opportunity to offer a unique in-room experience to the guests through the 250 Smart TVs in the hotel. Guests have now access the latest IPTV and VOD technology and a vast variety of video on demand movies. In addition they can enjoy all hotel services and facilities and information, through the comfort of their in-room TVs. MCOMS will be participating in the forthcoming HITEC at Conrad Dubai 2017, November 14-15. You are invited to visit our booth #142 to experience the latest in IPTV, VOD, Casting, Mobile and Signage Solutions for your Hotel. MCOMS will showcase the new HOTstream TV UXs cutting edge design and possibilities. Check out HOTstream View, HOTstream Mosaic and HOTstream Flex or ask us to design a custom solution for your property. MCOMS will also be sharing all the latest features like: new content Management Tool (OMS), live demo of our multiple integrations with hotel systems, as well as our offerings in Casting, OTT and Cloud TV technology. The Beau-Rivage Hotel, member of the Leading Hotels of the World (http://www.beau-rivage.ch/en/hotel-geneva/) has partnered with MCOM Media Communications to offer a unique in-room experience to the guests. Entering a new chapter in its more than 150-year history, Beau-Rivage masters the harmony between its historic classic atmosphere and a vibrant modern touch. The new celestial floor offers breathtaking views over Lake Geneva, its water fountain and the Mont-Blanc. Spectacular rooms and brand-new duplexes and suites, with a private spa bathed in daylight, exceptional views, unique volumes and extremely comfortable beds from which you can admire the stars. MCOM Media Communications has already installed HOTstream Interactive TV and VOD solutions to the 94 hotel rooms and 19 suites. Through HOTstream TV, guests can have access to all hotel facilities and services, view their bill and also enjoy a vast variety of TV channels and video on demand movies. On top of that, MCOM also delivered HOTstream OTT, a pioneering solution that allows guests to watch their favorite TV channel or movie either on their own mobile device or on hotel’s complimentary in-room tablets.. In parallel, MCOM managed to utilize hotel’s existing infrastructure to the full extend, installing HOTstream TV in a hybrid environment, including new hospitality Smart TVs but also Smart STBs to work with existing in-room TVs. MCOMS also introduced the ‘Guest Satisfaction Message’ feature, specifically designed for the hotel, through which the hotel can receive instant feedback from guests and allows them to express their level of satisfaction during their stay. Founded in 1865 by Jean-Jacques Mayer, Beau-Rivage has remained in the hands of the same family over five generations. Faithful to its founding philosophy, the family perpetuates the Beau-Rivage spirit with great passion in reverence to the grandeur that has been shaped over time by distinguished guests and eminent visitors. Along the coveted promenade of the shores of Lake Geneva, Beau-Rivage enjoys a privileged location in the heart of Geneva: close to the business district; five minutes from the Old Town; and within ten minutes drive from the airport and international organizations. Since its opening, Beau-Rivage has cultivated an authentic art de vivre (lifestyle), and today it vaunts 80 splendid rooms and 15 magnificent suites, each of which are a real discovery. For over 150 years, the hotel and its sublime treasures offer every visitor the unique privilege of beauty and refinement. MCOM Media Communications will be participating in the forthcoming Hotel Tech Live 2017, at ExCel London, September 26-27. You are invited to visit our booth #2081 to experience the latest in IPTV, VOD, Mobile, Digital Signage and Cloud Solutions for your Hotel. MCOMS will showcase the new HOTstream TV UXs cutting edge design and possibilities. Check out HOTstream View, HOTstream Mosaic and HOTstream Flex or ask us to design a custom solution for your property. MCOMS will also be sharing all the latest features like: new content Management Tool (OMS), live demo of our multiple integrations with hotel systems, as well as our offerings in Screen Mirroring, Content Casting and OTT technology. Please visit our website, http://www.mcoms.com to see all of our products and get any additional information you may need. Santorini, Greece, August 22, 2017. Grace Santorini, an exclusive boutique hotel in Santorini, Greece has completed the installation of MCOMS HOTstream TV and Mobile solutions, thus offering guests the opportunity to enjoy five-star technology in an experiential boutique property. Set in Imerovigli, the most secluded yet cosmopolitan part of the island, Grace Santorini lies 300 meters above the Caldera basin. The location offers mesmerising views over the Aegean and the famed Santorini sunsets. Unmatched service and attention to detail resonates throughout, from the stylish guest rooms and suites with their calm interiors, to the main reception area with its designer lighting, to the iconic view restaurant, Santoro. The décor offers a stylish simplicity that epitomises Santorini. MCOMS was asked to install all 21 rooms and suites with the latest HOTstream TV solution that comprises of an extended variety of channels, access to all hotel services, information and promotions, as well as a wide selection of over 200 HD movies, available on demand to all guests and powered by HOTstream VOD. MCOMS has also designed a custom mobile application for both guest-owned devices and hotel in-room tablets. Guests can use the tablets to access all services, like view bill, reservations, hotel directory, TV control, and more. More importantly, the HOTstream Mobile application shares the same design principals as the TV user interface and is available in the cloud as well as locally. Those who are looking for an enhanced wellness holiday will benefit from our new dedicated yoga and Pilates studio with adjoining fitness area, where we offer daily complimentary yoga sessions. The pride of this romantic escape is The Villa – a 400 sq m double suite offering the ultimate luxury on Santorini island with the perfect view of Greece’s Aegean Sea amid privacy and tranquillity. Ideal for couples or small groups, it has its own private spa and kitchen, a huge private pool and extensive secluded sunbathing areas. It is the ultimate expression of a boutique hotel in Santorini, a true jewel of the islands, and one of the best in the Mediterranean. With our iconic infinity pool offering an uninterrupted sea view, luxury accommodation in Santorini has never been better situated – the perfect boutique hotel in Santorini for a holiday or honeymoon. Toronto, CA, June 23, 2017. MCOM Media Communications (www.mcoms.com) proudly announces a record number of new HOTstream projects in North America, Europe and the Middle East for 2017. Amathus Beach Hotel – Limassol, Cyprus, Beau-Rivage- Geneva, BlueWaters by Meraas- Dubai, BVLGARI Resort and Residences- Dubai, Dukes – Dubai, Grace Santorini – Santorini, Greece, Hotel Grande Bretagne – Athens, Greece, Jumeirah Beach Hotel – Dubai, InterContinental Dar Al Tawhid Makkah – Saudi Arabia, JWMarriott® Phu Quoc Emerald Bay Resort & Spa – An Thoi Town, Vietnam, Marsa Alseef by Meraas – Dubai, The Stavros Niarchos Foundation Cultural Center – Athens, Greece. Acqualina Resort and Spa on the Beach – Miami , Bossert Hotel – Brooklyn NY, Como Metropolitan – Miami Beach, Condado Vanderbilt – Puerto Rico, Fairwind Hotel – Miami, Public Hotel – New York, Soho Beach House – Miami, Soho House – Chicago, Soho House -New York, The Standard, High Line – NYC, The Standard, EastVillage – NYC , The Standard -Hollywood, The Standard – Downtown LA, The Standard – Miami Beach.The US portfolio also includes properties that selected our cutting-edge Cloud Solution: Betsy South Beach – Miami, Berkeley Shore Hotel- Miami Beach, Wythe Hotel – Brooklyn, NY. MCOMS is pleased to announce our newest luxury client, Crystal Cruises. We will be installed in their next three ships launching before the end of 2017. 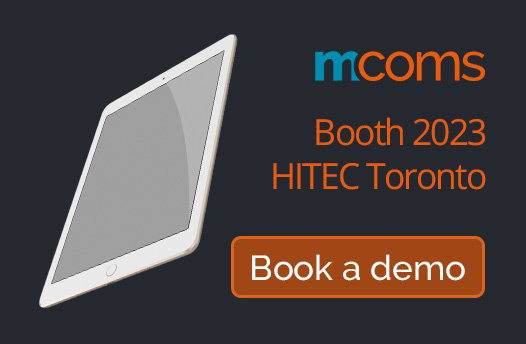 The full range of MCOMS HOTstream solutions, including our new OMS management tool, Screen and Content casting, OTT technology, Mobile solution, and our latest, IPTV, VOD and Digital Signage applications will be available for demos during HITEC Toronto, from June 26th to 29th. We look forward to seeing you in our Booth 2023. MCOM Media Communications is proud to announce the selection of MCOMS HOTstream Cloud suite by the newly renovated Betsy South Beach hotel (http://www.thebetsyhotel.com/) in Miami. MCOMS installed its cloud based solution, where everything runs on Amazon WS, eliminating the need to acquire and maintain on-premise expensive hardware. The legendary Betsy South Beach is a distinguished landmark hotel providing an elegant, personalized boutique experience in the heart of South Beach. The Betsy’s relaxed tropical interiors and 130 welcoming, beach side retreats create an aura that is passionately low-key. With exquisite amenities, incredible ocean views, world-class cuisine, and a unique commitment to the arts, the Betsy is within walking distance to shopping, culture and nightlife. The hotel is connected to MCOMS Cloud TV and VOD service on Amazon WS. MCOMS completed a mixed Smart TV and Smart STB installation as per the hotels’ requirements. Through HOTstream Cloud guests experience the latest IPTV and VOD technology and enjoy a vast variety of Free-to-Guest channels and Hollywood video on demand movies. In addition, guests access all interactive hotel services through their in-room TVs, including guest services, reservations and bookings. “We were looking for a turn-key solution that will anticipate our guests’ needs and expectations. MCOMS has delivered a complete Cloud TV solution that elevated the hotel experience we offer. We would also like to highlight the seamless cooperation we had with MCOMS team that installed the system and the excellent support services we are receiving” said Jeff Lehman, Managing Director at The Betsy South Beach. The Betsy –South Beach is a refined, beach-side haven located in the heart of South Beach, committed to timeless luxury and service, while offering incredible ocean views, exquisite amenities, world-class cuisine, and a unique commitment to the arts. Included as one of only three Florida hotels on the 2017 Condé Nast Traveler Gold List Award, the Betsy is considered one of the world’s best hotels. The Betsy -South Beach is a distinguished landmark hotel providing an elegant,personalized boutique experience in the heart of South Beach. The Betsy’s relaxed tropical interiors and 130 welcoming, beach side retreats create an aura that is passionately low-key. With exquisite amenities, incredible ocean views, world-class cuisine, and a unique commitment to the arts, the Betsy is within walking distance to shopping, culture and nightlife. MCOM Media Communications (www.mcoms.com) has released HOTstream 6.0, a new guest facing solution with next-generation customizable user interfaces available for any screen. HOTstream 6.0 was designed to respond to the fast growing expectations and needs of the modern traveler allowing the hotelier to offer quality and revolutionary services. The new hospitality platform comes with industry’s most wanted features in IPTV, screen casting, OTT apps, Mobile FTG TV and VOD and is open to 3rd party integrations. Among the key new features of HOTstream 6.0. new UX technology, is that it enables dynamically generated user interfaces that mix menu options with products and promos that are consistent for any screen size or orientation and a screen casting or mirroring service that allows guests to stream and watch content from their devices on the TV. HOTstream 6.0 new features also include RCU on the mobile, shared TV and mobile favorites, EPG and movie guides, Mobile TV and OTT services, as well as a web-based OMS tool kit. MCOM will present HOTstream 6.0 for the first time in the EMEA area, at The Hotel Show in Dubai, from 17-19 September.